Temperament: The Silky Terrier is a keenly alert, friendly, loving and responsive dog with all of the terrier characteristics. They are very intelligent, cheerful and sociable dogs who love to be with their master. Family Dog: The Silky Terrier is typically very good around children if they are raised with them. They can be snappish at times and should not be played with roughly or teased. They are not typically trustworthy around other pets unless socialized with them at a young age. They are typically reserved around strangers. Shedding: The Silky Terrier sheds little to no hair. Grooming: The coat of the Silky Terrier is prone to matting and should be brushed daily. They should be bathed regularly to keep their coat in top condition. This breed requires lots of grooming and maintenance typically 15 minutes a day. The coat needs to be trimmed occasionally. Training: The Silky Terrier is an intelligent dog that is eager to please and quick to learn new commands. Barking: The Silky Terrier can become a barker if not controlled. Exercise: The Silky Terrier is full of energy and needs a daily walk as well as regular chances to run and play off leash in a safe area. Living Conditions: The Silky Terrier will make a good apartment dog as they are very active indoors and do alright without a yard. Appearance: The Silky Terrier has a low set body with refined bone structure that is slightly longer than it is tall. The overall appearance should give the impression that he is able to hunt and kill domestic rodents. The body is covered in a long, silky coat that is parted down the middle of the back falling flat on each side of the body. This breed should have a well groomed but not sculptured appearance. Size: The body of a Silky Terrier should be 9 to 10 inches tall at the shoulders. Their average weight is between 8 to 11 pounds. Head: The head of the Silky Terrier is strong and wedge-shaped with a keen expression and shallow stop. The skull should be flat and narrow between the ears. The length of the head is slightly longer than that of the muzzle. Nose: The Silky Terrier has a black nose. Eyes: The Silky Terrier has small almond shaped eyes that are dark in color with dark rims. Ears: The Silky Terrier's ears are small and v-shaped. They should be set high on the head and carried erect. They should not have any tendency to flare obliquely off the skull. Teeth/Bite: The teeth should be strong and meet in a scissors bite. Neck: The Silky Terrier has a medium length, fine neck fitting gracefully into the sloping shoulders. Body: The low set body of the Silky Terrier should be about one fifth longer than it is tall with a light build and strong, fine bones. The topline is level. The chest is of moderate width and deep extending down to the elbows. Forequarters: The Silky Terrier's well laid back shoulders and upper arm angulation set the straight, strong, fine-boned front legs well underneath the body. Hindquarters: The Silky Terrier has strong, muscular thighs but should never appear heavy. The stifles are well angulated with low hocks that are parallel to each other when viewed from behind. Gait: The gait of the Silky Terrier should appear free, lively and straightforward with the hindquarters propelling the dog forward with power. Feet: The Silky Terrier has small, round, compact, catlike feet that face straight forward with thick, springy pads and strong, dark nails. The dewclaws, if they have any should be removed. Tail: The docked tail of the Silky Terrier is set high on the rear and carried at twelve to two o'clock position. Color: The coat of a Silky Terrier is Blue and Tan. The blue color may be silver blue, pigeon blue or slate blue. The tan is a deep and rich shade. The coat from the base of the skull to the tip of the tail is blue in color. The upper forelegs and half way down the outside of the thighs are also blue in color. The blue color on the tail should be very dark in color. The coat on the muzzle, cheeks, base of the ears, legs and feet is tan in color. The Silky Terrier's topknot should always be silver or fawn in color and lighter than the tan points. Coat: The Silky Terrier has a straight, single coat with a glossy appearance and silky texture that falls below following the outline of the body but never reaching floor length. The hair on the top of the head is thick and profuse allowing the formation of a topknot. The hair on the face and ears should not be overly long. The coat is distinctly parted down the back to the tail. The unplumed tail is thickly coated. The legs should have a short coat of fur from the pastern and hock joints to the feet which should not be hidden by the leg furnishings. Life Expectancy: The average life expectancy of the Silky Terrier is about 12-15 years. Characteristics: The Silky Terrier is a very curious dog. They also love to dig. Despite their size they make excellent watch dogs and are very protective of their family. They make excellent travel companions. Health: The Silky Terrier is generally a healthy breed with some minor concerns including intervertebral disc disease, elbow dysplasia, patellar luxation, Legg-Perthes, diabetes, epilepsy and tracheal collapse. 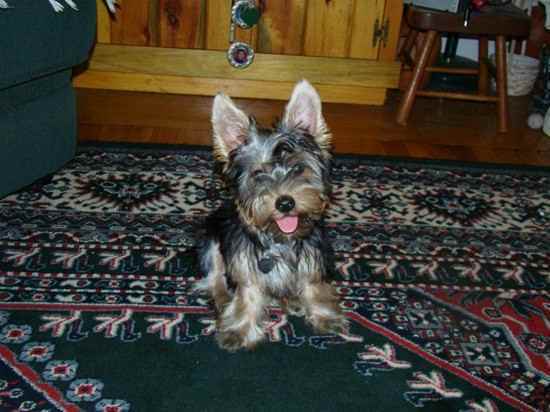 History: The Silky Terrier was originally developed in Australia during the 19th century. This breed was created from other terrier breeds including the Skye and Cairn Terriers with primary influence from the Australian Terrier and the Yorkshire Terrier. The Silky Terrier was brought to America by servicemen stationed in Australia during World War II. They were first recognized by the AKC in 1959 with the breed standard first established in 1962 and update in 1967.